A 13-year-old Syrian boy makes his way along a dangerous migrant route through the refugee camps of Greece to the mountains of Macedonia, pursuing an unrealistic dream of finding a place in Germany to relocate his mother and sisters, left behind in Turkey while attempting to escape the chaos of their devastated country. 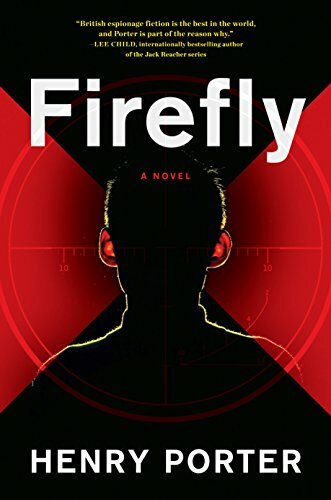 Code-named Firefly by British intelligence, young Naji carries explosive information on his cellphone that will compromise a deadly Islamic State cell. Hoping to find the boy before the terrorists catch up to him, MI6 hires freelance operative Paul Samson to pick up Naji’s trail and convey him to safety before it’s too late. Firefly is Henry Porter’s sixth thriller. A journalist and UK editor of Vanity Fair, Porter has written extensively about terrorism, migrants, and their effect on Europe for the Hive, the magazine’s online news site. While researching a story for the Hive, he visited a refugee camp on the Greek island of Lesbos and saw first-hand the conditions faced by the people caught up in this human tragedy. He then spent the winter following a migrant trail through Greece, Macedonia, Serbia, and Croatia. Firefly was the result of this in-depth research. While Porter is featured as a writer of espionage fiction in the vein of John le Carré, Firefly is better appreciated as a classic chase story. It follows the points of view of young Naji and Paul Samson, alternating effectively between them as Samson closes the gap, then suffers setbacks, then experiences turns of good fortune that propel him to within eyeshot of his young quarry. The boy is an excellent character, intelligent and curious, resilient and brave. His determination to rescue his family from Syria’s death throes warms our heart, and his irrepressible optimism, while surprising given everything he has witnessed, carries the mood of the novel above what would otherwise be a depressingly realistic depiction of the refugee crisis. Paul Samson, Porter’s co-protagonist, is a former Lebanese refugee who settled in England with his parents when he was a young boy. His surname (a tribute to Bernard Samson, Len Deighton’s famous intelligence officer?) is Anglicized from his father’s given name, Shamshun. The character is intriguing but quite underdone. We have glimpses of his mother, who runs a highly successful restaurant in London with an iron fist, we learn that Samson bets on horse races with the care and attention to detail of a surgeon, and we know that he’s no longer a spy—he finds people. Beyond that, Porter feeds us precious little meat. The character feels truncated, as though almost everything about Samson has been explained elsewhere and doesn’t bear repetition here, despite the fact that Firefly is a standalone. Will he appear again in future Porter thrillers? One would hope so, preferably with the admirable Naji at his side. At the end of the day, while Firefly is a well-written account of the dangers and hardships of the migrant trail followed by Syrian refugees, it reads more like a commercial entertainment. It bobs along the surface of this human crisis without descending too deeply into the darkness below. Rather like the dolphin that was said to have saved Naji and the baby he rescued from drowning in the novel’s prologue, Porter insistently nudges us upward, away from despair and toward hope. Perhaps it makes Firefly somewhat less intense than originally intended, but it certainly makes it readable and, yes—entertaining.